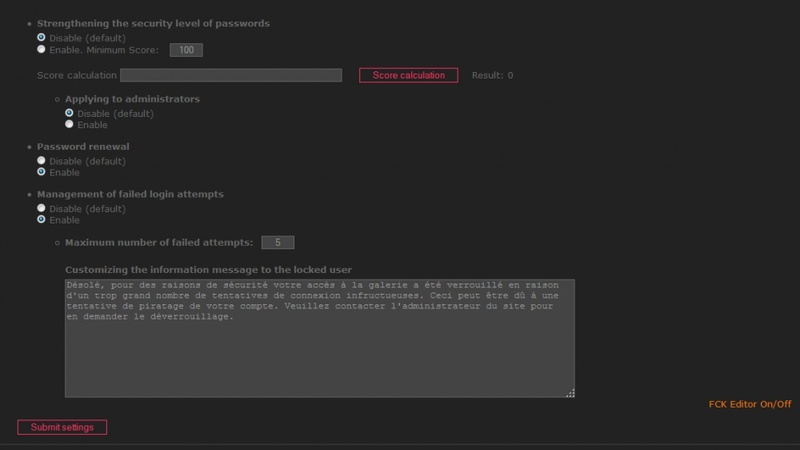 Descripción: This plugin adds password policies. If enabled, a password complexity score must be set. All passwords chosen not respecting this score will be rejected. The administration module of the plugin allows to test the complexity configuration. Enables the management tab in plugin administration panel to list registered user and allows to manually initiate a renewal of the password of one or more registered users. At their next login , they will be automatically redirected to their profile page and prompted to change their password. And this, until the action is performed. Allows to define a maximum number of login attempts with incorrect password. Beyond this limit, the user account is locked and can no longer connect to the gallery. He should contact the administrator to request the unlocking. The administrator can then perform the unlocking in the users management tab of the plugin where a symbol will show locked accounts. Fixed - Admins and Webmaster accounts were not correctly excluded on login failure protection (after x login failure).